17. How can we build a structure to be alive inside? To to to-wards a building of space and commons that privileges movement and margins. 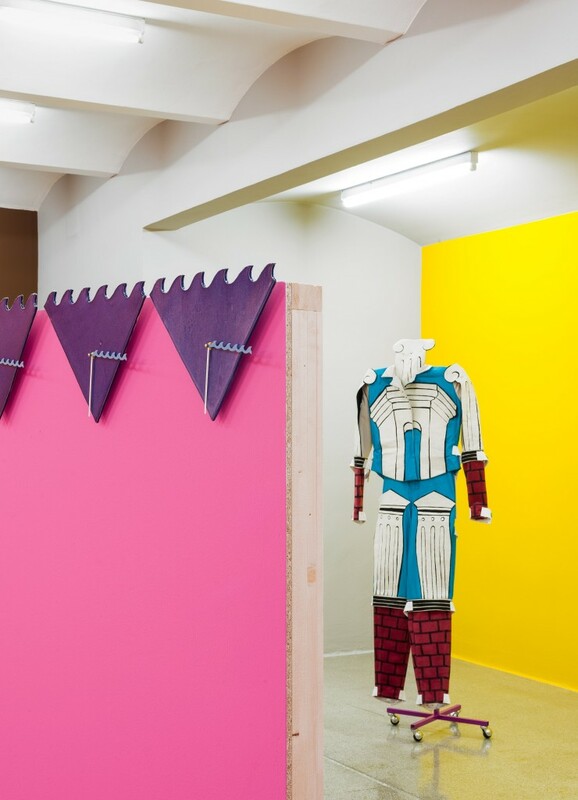 For her first solo exhibition in Austria, Emily Roysdon has developed a scenic environment whose character is deliberately left undefined, somewhere between installation art, stage setting, and performance space. Its conceptual point of departure is Roysdon’s essay Uncounted, which develops a vocabulary around the artist’s ideas on performance and time. Divided into 23 short sections, it collages quotes, poetic digressions, and philosophical meditations to chart her thoughts on time, theater, performance, hierarchies, resistance, and emancipatory practices. Over time, the artist found that the text evolved into a sort of script. 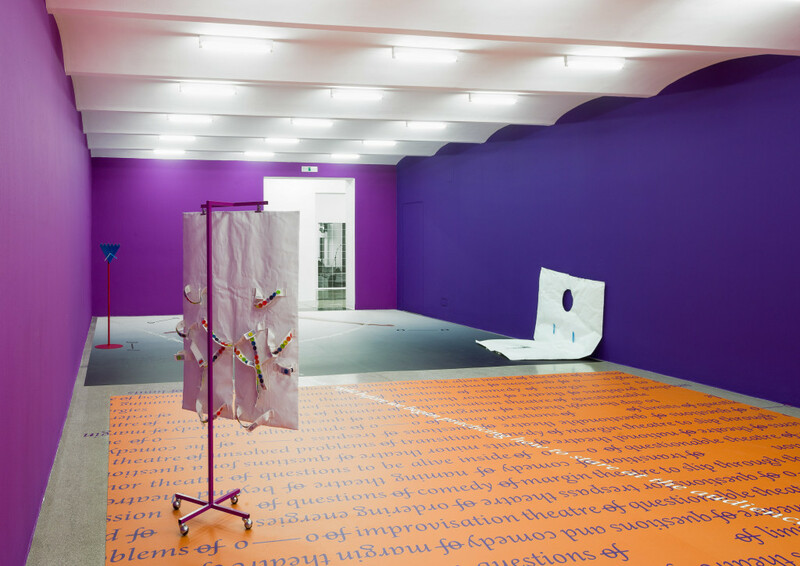 For the show, Roysdon focused her attention on three poetic phrases articulated in the text: “aliveness trespasses, it doesn’t know it’s marginal”; “to perform as an unsolved problem”; and “a structure to be alive inside”. Thinking through this last proposition led Roysdon to explore practices of experimental theater and theories of improvisation. It is the first time that the reflection on theater—which has always been present as an undercurrent in her work—moves to the forefront of an exhibition project. 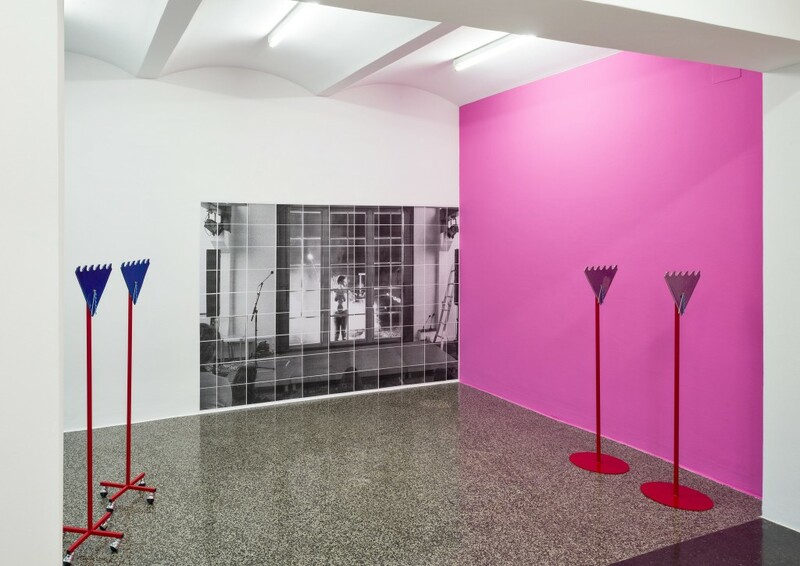 At the same time, the conjunction of the theatrical and exhibition formats raises new problems, since the two are defined by widely different parameters of time, sequential organization, and subjects. Hence the lack of protagonists in Roysdon’s setting. It is her attempt to investigate the fundamental questions of movement and aliveness, and for the Secession installation she is asking: what is the locus of movement in the absence of the body? 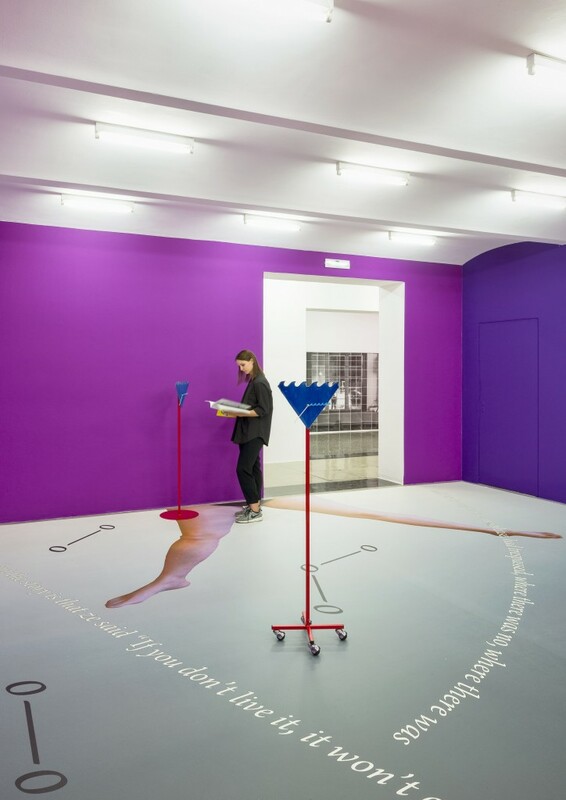 Walls painted in different colors, an installation of handmade clocks, costumes positioned throughout the gallery, and a graphic vinyl carpet the visitors are invited to walk on: these are the exhibition’s main elements. The installation of ceramic clocks, some wall-mounted, some freestanding, incorporates a symbol Roysdon devised to signify “other kinds of time”: an upside down triangle with a wave motif at the top. The clocks, 20 of them side by side, form a new horizon line. 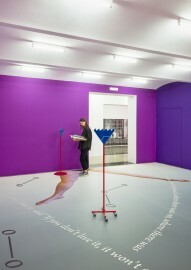 The floor piece, the exhibition’s largest component at 83 square meters, consists of two distinct parts. The first part combines an image of exaggerated legs, text and hand written notes that refer to the writings of Virginia Woolf, Charlie Parker, Richard Foreman, and Jack Smith. The second part is a litany of text that may be read in either direction and introduces key terms for a discourse on theater, marginality, and improvisation. Visible in both halves is a sign that might belong to a system of choreographic notation. This symbol O—O (“circle line circle”) stands in for Roysdon’s idea “how not to be the thing itself,” which is discussed in Uncounted and reflects her ethics of collaboration and improvisation. The floor design quite literally serves as a dramaturgical backdrop and immediate setting for live actions. The garments, meanwhile, take inspiration from legendary costume designs featuring architectural elements like brick walls and columns by the Italian artist Giorgio de Chirico, who designed them for the Ballets Russes in 1929. Roysdon’s creative adaptations, however, more closely resemble façades to be hung in front of the body; despite their architectonic appearance, they signal fragility and vulnerability and highlight the antagonism between the body’s mobility and the immobility of architecture, between subject and object. Displayed on movable metal racks scattered across the room, the costumes are transitional pieces that discompose the dramaturgy of the gallery and/or theatre. The wavy lines of the clocks meet the brick walls of arms and legs: animation clashes with rigidity. 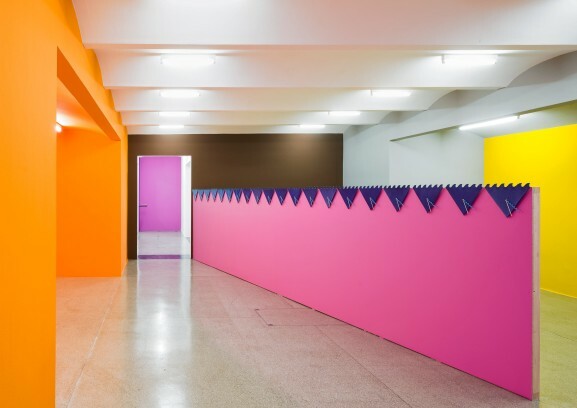 With these layers of method and material, Roysdon’s installation explores performance structures and invites the visitors into a “transitional space”. Is it a “comedy of marginal theatre,” a “theatre of limits,” a “theatre of unsolved problems,” or simply a “questionable theatre”? 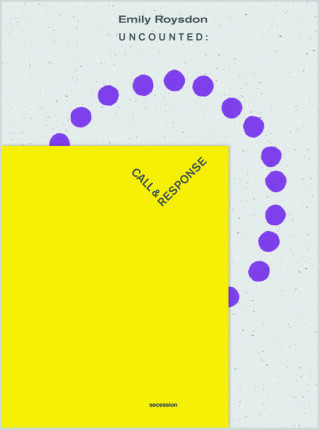 Roysdon’s text Uncounted also provides the conceptual framework for the artist’s book titled Uncounted: Call & Response published in conjunction with the exhibition. Roysdon has invited 23 other artists and writers working in a variety of fields to contribute responses to selected sections. Emily Roysdon, born 1977 in Maryland (USA), is a New York and Stockholm-based artist and writer. Her working method is interdisciplinary and recent projects take the form of performance, photographic installations, print making, text, video, curating, and collaborating. She is editor and co-founder of the queer feminist journal and artist collective LTTR.